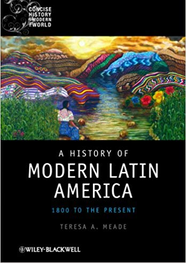 Teresa Meade is the Florence B. Sherwood Professor of History and Culture at Union College, Schenectady, NY. Pardoned by President H.W. Bush, Abrams went to work in the administrations of both George H.W. and George W. Bush, promoting the invasions of Iraq and Afghanistan, and undermining Iran in whatever way possible. Along with other neocon cheerleaders for regime change in the Middle East—a project that was supposed to be a “cake walk”—Abrams created a mess. Undeterred by all that icing clinging to his shoes in the quagmire that has spread to engulf one country after another in America’s longest wars, Abrams is now at work scheming to depose the very vulnerable and unpopular Nicolas Maduro. In addition to his sterling record of lying, deceit, and incompetence, Abrams brings to this job his previous experience in the George Bush administration where he is credited with giving the “green light” to taking out Maduro’s predecessor, Hugo Chavez, in 2002. That adventure was so poorly planned that Bush had just barely recognized the new US puppet Pedro Carmona when it became embarrassingly clear that Chavez hadn’t been deposed at all and was back at the helm. In summary, everything Elliott Abrams has touched has turned out badly. He and others like him have never seen a crisis that couldn’t be solved by throwing massive amounts of military hardware at regimes and leaders who have fallen out of favor with the US agenda. After decades of war, the Taliban are negotiating their way back into power, with the resultant carnage reminiscent of a phrase from a Bruce Springsteen song about a friend who had died in another futile and wrongheaded war: “They’re still there and he’s all gone.” In every country Abrams touches the “all gone” are hundreds of thousands of civilian children, parents, American, Afghan, and Iraqi soldiers and personnel. As liberals and conservatives fall over each other decrying the misery of the Venezuelan people, the usual re-writing of history is well underway. Everywhere Venezuela is referred to as a prosperous, rich, stable democracy before it fell into the hands of former leader Hugo Chavez and his successor, Nicolas Maduro. The tedious reality that undermines this picture of an oil rich Garden of Eden is the fact that Venezuela has been a dramatically divided country since oil was discovered in 1935. Under the military dictatorship of Juan Vicente Gómez, Royal Dutch Shell and Standard Oil were granted concessions to pump and refine the oil, while Gómez collected the money and spread it around to his military buddies. In 1975 President Carlos Andrés Pérez nationalized Venezuela’s oil and established a state-owned enterprise, PDVESA, as a separate, parallel governing body to manage oil production. Oil revenues are the single source of Venezuelan revenue and the entire system has always been managed through the military. Except for intermittent windows of democracy and reform, the bulk of the country’s export revenue was never spread to the impoverished majority. Despite reasonable returns, from 1970 to 1998 per capita income fell by 35 percent, one of the sharpest and most prolonged declines in the world. Although Venezuela today is definitely in a crisis far more severe than in years past, and one which Maduro and his party show no sign of resolving, the underlying cause is not new. Since the 1970s Caracas has been one of the most unlivable cities on the planet—rimmed by mountains of mind-bogglingly poor slums lacking rudimentary housing, sewage systems, water, and infrastructure. Thecity is choked by pollution, overbuilt with well-guarded high rise apartments for an elite content to spend their oil wealth in shopping malls, restaurants, and amenities for everything but the public good. In 1989 the city exploded in days of rioting when a newly elected president reneged on his campaign promise and struck a deal with the IMF that cut basic services to the millions of poor already living in abject poverty. Interestingly, Juan Guaidó, the legislative leader turned self-appointed president promises to negotiate a deal with international banks and the IMF to bail out the cash-starved economy. Hugo Chavez at least tried to change this dismal record. As former US president Jimmy Carter wrote on Chavez’s death in March 2013, despite his deep disagreements with some of his policies, under Chavez “Venezuelan poverty rates were cut in half, and millions received identification documents for the first time allowing them to participate more effectively in their country's economic and political life.” As Greg Grandin points out, Chávez submitted himself and his agenda to fourteen national votes, winning in elections that Carter certified as honest and fair, even better than most of the 92 elections the Carter Center supervised and whose results world bodies accepted. Chavez, and Maduro after him, relied on oil revenues to build schools, finance cooperatives, and institute healthcare, trading Cuban doctors for oil. Oil went everywhere, even to the poor of Massachusetts and the Bronx. The Venezuelan elite complained bitterly about their bold and uncouth leader, but as long as their privileges remained somewhat intact, and the military kept their share, the system limped along. But oil prices have been in a slump for nearly a decade. Corruption permeates the system as it has in the past, but the money to grease the wheels has disappeared, along with the charismatic and energetic leader who seemed to have really cared. Today, Venezuela is ruled by an unpopular authoritarian, who lacks the skills of leadership and the resources to paper over the deepening cracks. In steps Elliott Abrams, the representative of a deeply flawed president who according to his own intelligence service, won office with the assistance of a foreign, often hostile, power. Abrams represents a president who repeatedly seeks to discredit the press, who lies unabashedly, who presides over a revolving door of advisors who are either under indictment or already in jail, who cares little for civility and the preservation of his own country’s natural resources, and appears to be in office in order to enrich his family business. Despite record high levels of income inequality and unprecedented profligacy of the super rich, his administration’s greatest accomplishment is a tax reform that benefitted the top one percent and eased corporate tax rates. Ever since the Supreme Court ruled that a corporation has the same rights as a human being, the entire political process serves the interests of the highest bidder, including military contractors and arms manufacturers. The regime has been met with disillusionment and sporadic street protests, including women-led marches of over a million people, the largest in the country’s history. Nonetheless, a third of the populace avidly supports the president. In a desperate attempt to appease his base the president shut down the government in a fit of pique over money to build a medieval wall to keep out migrants, many of whom are held in cages and tents along the southern border. For weeks the airwaves filled with stories of government workers lining up at soup kitchens, unable to pay their bills, worried about putting food on the table or meeting pressing healthcare needs. The single strongest opposition in the government has come from the head of democratically-elected legislature. The legislature held firm and, for the time being, the authoritarian president has backed down. I don’t know if Canada has contacted Nancy Pelosi to see if she wants to declare herself president, but it could. Obviously the situation in Venezuela is more extreme, but the comparison with the current crisis in the United States is not unfounded. We have watched for over a month as the richest country in the world, some say the richest of all time, has pushed gainfully employed people to penury. Obviously we are living in a deeply divided country, headed by a president with little knowledge of how most of the citizenry lives. In the midst of this crisis, or as a result of it, the US government is playing with deposing the ineffective leader of another country, whose election is apparently marred with greater improprieties than our own. 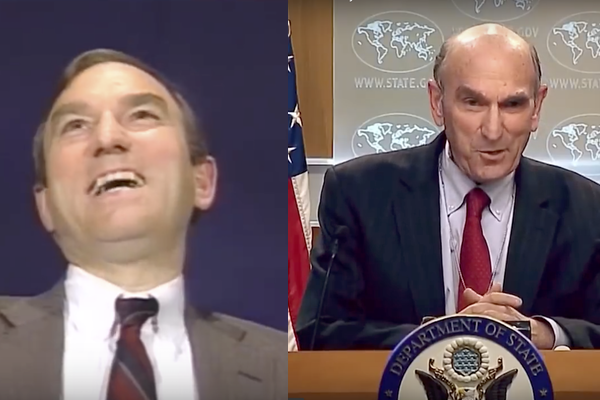 Without a doubt, Elliott Abrams is the man for the job.